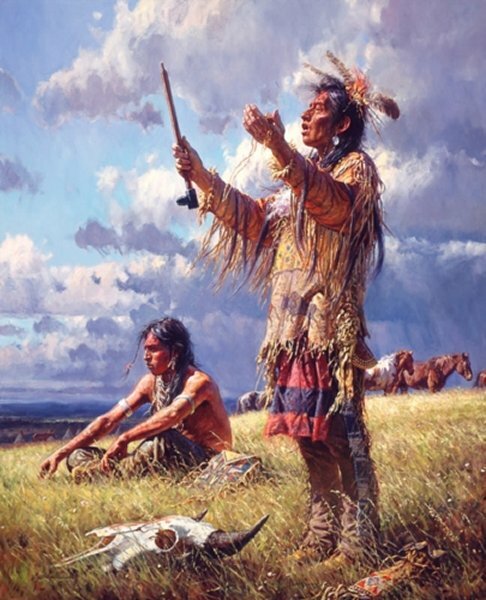 From George Bird Grinnell's "Blackfoot Lodge Tales", "In the evening of the day preceding a drive of baffalo into the pis'kun a medicine man, usually on who ws the possessor of a buffalo rock, In-is'-kim, unrolled his pipe, and prayed to the Sun for success." From "The Mystic Warriors of the Plains", by Thomas E. Mails, "All of the Plains tribes had special songs which they believed would make the buffalo approach their camp areas. And all teh tribes had dreamers and holy men who would conduct secret rites and then prophesy where the buffalo were most plentiful."